One of the challenges I'm taking on with the Nesties this year is a genre challenge. At the beginning of the year we came up with a list of genres and challenged each other to read through as many as possible. Because I'm an overachiever, I chose to challenge myself to read all of them. One genre on the list is true crime. When I heard an interview with the author of this book on NPR's Fresh Air, and then saw the book appear on the FLP ebook downloads page, I knew it was a sign. 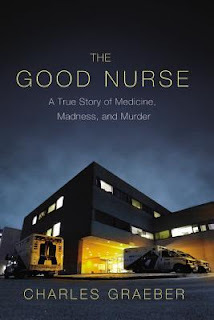 It's the true story of Charles Cullen, a nurse who spent sixteen years working his way through hospitals in New Jersey and Pennsylvania killing the patients he was supposed to be caring for. On the outside, he was a competent, even skilled nurse, but his personal life is out of control and he copes by killing patients - a number as potentially high as 300. I think this may be a case where NPR led me astray. I was predisposed to find the book academically sound and meticulously written because, hello, Fresh Air! But it let me down in both regards. I mean, it's obvious the author has done his research and knows the story inside and out, but I wasn't really thrilled with the quality of the writing. It met my academic standards but not my literary standards. It was overly wordy and portions dragged out or repeated unnecessarily. And the tone was much more conversational than I expected I suppose with it being on Fresh Air I was hoping for an academic true crime and what I felt like I got was standard paperback fare. Despite my disappointment with the quality of the writing and a few draggy parts, the story itself was fascinating. It's hard to believe that these things happened in recent years and that Cullen was able to get away with murder for so long and at so many hospitals. It will definitely give you second thoughts about how safe you are in what you think should be a extra-safe environment. What interested me the most was the investigation into hospital administration and the lack of responsibility that allowed Cullen to commit his crimes. I think there's a limited audience for this book among my typical readers. It will obviously appeal to fans of the genre. And I've had the opportunity to personally recommend it to a friend who is a nurse in the same area of the country, but other than her, I can't come up with any friends who I think this would really appeal to. Taking on a variety of genres as a challenge. Sometimes I step out and try something but for me it's rare. Like once I read a romance novel (okay, if you knew me, you'd be saying..."Umm, wow!" My mother-in-law read a lot of them and I thought it would give me something to talk with her about. It did, sort of, but romance just wasn't my thing. Hope you find some things you really like, both the writing and entertainment.